Watch a presentation I did on the hill in 2013. 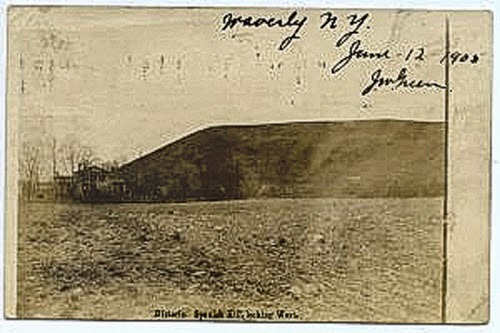 Spanish Hill, a 230 feet high, flat-topped glacial moraine located in South Waverly, PA once had earthen embankments with an interior ditch around it's top which were plowed away by the end of the Civil War. For a hundred years since, children and adults alike have searched this place for arrowheads and other artifacts left behind by the mysterious ancient people who once called this place their home. The hill continues to keep itself draped in mystery for all to wonder just who built the huge enclosure on it's top centuries ago and what happened there...and I hope that this site makes you consider these things as you read through the pages. This website is dedicated to the continued research of this site that has captured the imagination of locals for centuries and about the people who have preserved the information that we have today and in doing so - effected our understanding of it.